Positron emission tomography (PET) is a highly specialized imaging technique using short-lived radiolabeled substances to produce extremely high resolution images of the body's biological function. Besides being used to investigate the metabolism of normal organs, PET has also become the technique of choice to investigate various neurological diseases, including stroke , epilepsy, Alzheimer's disease , Parkinson's disease, and Huntington's disease. Various psychiatric disorders, such as schizophrenia , depression, obsessive-compulsive disorder , attention-deficit/hyperactivity disorder , and Tourette syndrome, are also imaged by PET, because these disorders have changes in specific areas of the brain . Additionally, PET scanning is a powerful research tool to detect changes or abnormalities in areas that may be difficult to visualize using other radiological procedures. In the field of mental health, a PET scan may be used when a patient seeks medical help for symptoms that could possibly be caused by a brain tumor. These symptoms may include headaches, emotional abnormalities, or intellectual or memory problems. In these cases, a PET scan may be performed to "rule out" a tumor, so that other tests can be performed in order to establish an accurate diagnosis . PET is especially utilized in persons affected by cancer because it can detect metastatic tumors that may not be visualized by other imaging techniques. It is also being increasingly used not only as a cancer diagnostic tool, but also to help researchers design the most beneficial therapies. For example, it may be used to assess response to chemotherapy. PET imaging is very accurate in differentiating malignant from benign cell growths, and in assessing the spread of malignant tumors. PET is also used to detect recurrent brain tumors and cancers of the lung, colon, breast, lymph nodes, skin, and other organs. In some cases, patients may be allergic to the radioactive agents used for PET. A patient with known allergies should discuss this with their specialist before undergoing the PET scan. PET is used in conjunction with compounds that closely resemble a natural substance used by the body, such as a simple sugar (glucose, for example), labeled with a radioactive atom and injected into the patient. These compounds (radionuclides or radiopharmaceuticals) emit particles called positrons. As positrons emitted from the radionuclides encounter electrons in the body, they produce high-energy photons (gamma rays) that can be recorded as a signal by detectors surrounding the body. The radionuclides move through the body and accumulate in the organs targeted for examination. A computer collects the distribution of radioactivity and reassembles them into actual images. By further defining a lesion seen on other imaging modalities, PET may enhance assessment of tumors exceedingly well. This is because of its operating principle. The radiolabeled sugars injected into the patient will be used by all body cells, but more sugar will be used by cells that have an increased metabolism. Cancer cells are highly metabolic, meaning that they use more sugar than healthy nearby cells, and they are easily seen on the PET scan. PET images thus show the chemical functioning of an organ or tissue, unlike x ray, computed tomography , or magnetic resonance imaging , which show only body structure. The radiopharmaceutical is given by intravenous injection or inhaled as a gas a few minutes before the PET procedure. How it is administered depends on the radiopharmaceutical used and which one is selected depends on what organ or body part is being scanned. During the scan, the patient lies comfortably; the only discomfort involved may be the pinprick of a needle used to inject the radiopharmaceutical. No special aftercare measures are indicated for PET. 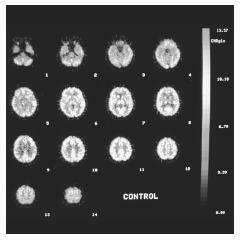 A positron emission tomography (PET) scan of the human brain. patients receiving exposures comparable to (or less than) those from other medical procedures, such as the taking of x rays. Other scanning radiopharmaceuticals—for instance, 6-F-dopa or radioactive water—normally cause even less exposure. The PET scan of a healthy organ or body part will yield images without contrasting regions, because the radiolabeled sugar will have been metabolized at the same rate. The PET scan of a diseased organ or body part, however, will yield images showing contrasting regions, because the radiolabeled sugar will not have been metabolized (breaking down a large molecule to a smaller molecule that can be used by the body) at the same rate by the healthy and diseased cells. Balazs, G., ed. Positron Emission Tomography: A Critical Assessment of Recent Trends. Norwell, MA: Kluwer Academic Publishers, 1998.
von Schulthess, G. K., ed. Clinical Positron Emission Tomography. Philadelphia: Lippincott, Williams and Wilkins, 1999. Anderson, H., and P. Price. "What Does Positron Emission Tomography Offer Oncology?" European Journal of Cancer 36 (October 2000):2028–35. Arulampalam, T. H., D. C. Costa, M. Loizidou, D. Visvikis, P. J. Ell, and I. Taylor. "Positron Emission Tomography and Colorectal Cancer." British Journal of Surgery 88 (February 2001): 176–89. Roelcke, U., and K. L. Leenders. "PET in Neuro-oncology." Journal of Cancer Research and Clinical Oncology 127 (January 2001): 2–8.